By John McKenzie, 9 February 2019. 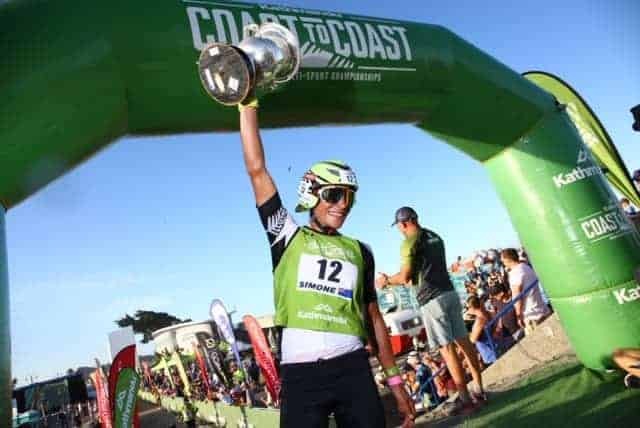 Dougal Allan and Simone Maier won the closest fought men’s and women’s Kathmandu Coast to Coast World Championship one day race in the events 37 year history. Hunt was first to drop off the pace with Manson taking the lead with Allan quick to follow the local kayaking river guide who was expected to be the days strongest on the river. Manson had a weak moment with about 20 kilometres left to kayak that Allan was quick to take advantage of eventually coming off the river with a four minute lead heading into the final 70 kilometre cycle leg into Christchurch, storming home 15 minutes ahead of Manson who also had his best result in the race. Hunt finished third. 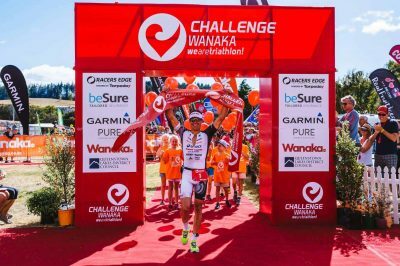 Surrounded by his young family 33-year-old Allan said coming back to race in his first Coast to Coast since 2013 was a chance to make amends and set an example for his kids. 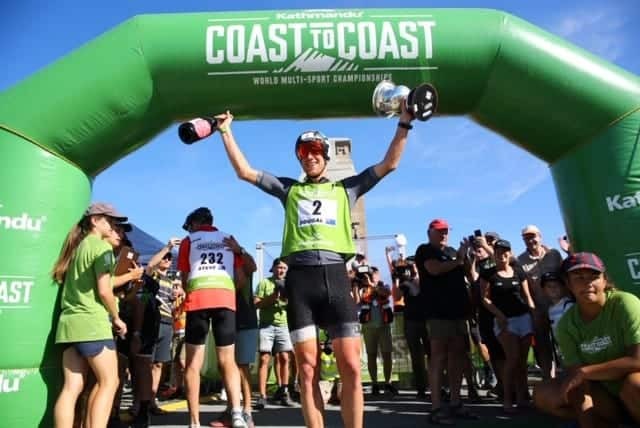 The women’s race was equally exciting with Christchurch based German Maier also claiming her first-time World Championship title in a time of 12 hours and 56 minutes beating four time champion Elina Ussher of Nelson by 11 minutes and Fiona Downling who came home in third two minutes behind Ussher. Lachie Brownlie’s superior kayaking skills and multi-sport experience saw him overtake overnight two day men’s leader Sam Bell to win the two day men’s event in 12 hours and 41 minutes. Bell slipped to third with Harry Llewwllyn moving up to second, 12 minutes behind Brownlie. Robert Loveridge and Tony McGuire built on the lead in the men’s two days team event to win in 12 hours and 24 minutes 12:24:50 while the White Knights team of penny Costello and Michelle Knight won the womens two day teams category in 15 hours and five minutes. Team Top Sport’s mixed team of Dainel Jones, Kate Cambie and Dan Barry were the fastest three person team winning in eleven hours and 18 minutes while Bender Bro’s Cory Sutherland and Calum Sutherland won the tandem team’s event in thirteen hours and 26 minutes. Former All Black Captain Richie McCaw and New Zealand Rugby Players Association boss Rob Nichol moved up two places to fourth in the open men’s category of the tandem team’s event won by Bender Bro’s Cory Sutherland and Calum Sutherland in thirteen hours and 26 minutes. “I was pretty average yesterday but luckily woke up feeling a bit better and yeah, we actually had a reasonable day, didn’t we,” McCaw said. Photo credit: Marathon-Photos.com: Dougal Allan and Simone Maier won the closest fought men’s and women’s Kathmandu Coast to Coast World Championship one day race in the events 37 year history.